Mineral wool insulated exteriors offer tremendous performance as well as a wide range of aesthetics. Sto Product Manager Karine Galla recently penned a piece in Construction Specifier on mineral wool as an option to enhance the thermal performance of continuous insulation on a building’s exterior. While mineral wool has been around for over a century, the article provides an overview on how the insulation is produced today and outlines its many attributes for exterior facades. Mineral wool is typically made from a combination of melted volcanic rock and steel slag spun into a mass of fine, intertwined fibers. These fibers conduct heat very well, but when pressed into rolls and sheets they create an excellent insulator. In addition to its thermal performance, mineral wool also appeals to designers and specifiers because of its fire resistance. Since mineral wool insulations are naturally noncombustible, they will not burn or release harmful smoke and hot gases. Mineral wool is also vapor permeable, with a vapor rating of up to 50. This means water vapor can readily diffuse throughout the material; it will not retain water. Since most mineral wool products are made from more than 50% post-industrial recycled content, and contribute so significantly to energy conservation, they are also considered very “sustainable”. As a result of these performance virtues, mineral wool is increasingly used in building exteriors. Especially when builders are looking to mitigate fire risk, noise intrusion, and energy waste, as well as ensuring moisture control in an “all-in-one-solution”. Mineral wool insulation has been widely used in industrial settings such as petroleum refineries and power plants, as well as for lofts, cavity walls, flat roofs and heating systems. It has also been used as an insulation layer behind various claddings such as curtain walls, rainscreen facades and exterior insulation and finish systems (EIFS). While suggesting that mineral wool products warrant consideration, Galla also outlines some of the product’s challenges and important factors to consider in designing a wall assembly with mineral wool insulation. These include: air and moisture control, detailing solutions at the joints and seams, making wind load calculations, ensuring fastener longevity, and determining impact resistance. StoTherm ci XPS is a continuous insulation system, which provides air, thermal and moisture control without the connection and compatibility challenges that characterize other systems, while also offering multiple design and finish options. Today’s architects, specification professionals, and owners are typically looking for an insulated wall design that not only meets but exceeds the nation’s increasingly demanding code requirements. Enter the StoTherm® ci XPS continuous insulation system, which provides air, thermal and moisture control without the connection and compatibility challenges that characterize other systems, while also offering multiple design and finish options. As the building industry adopts more stringent energy codes (Title 24, IBC, IECC, ASHRAE 90.1), the need for external insulated finish systems (EIFS) is increasing. The StoTherm ci system is highly energy efficient, minimizing heating and cooling costs while reducing greenhouse gas emissions. The components prevent thermal bridging, thus lowering the risk of heat leakage and the attendant energy loss. The system is also installation friendly; one installer and a single skilled trade person can make quick work of it. The low allowable deflection value makes for lightweight construction, which reduces overall project cost and weight per square foot. These factors make for material and labor costs that are highly competitive, if not more economical than most other options. A wide range of decorative and protective wall finishes (StoCreativ® Brick, granite, limestone) along with unlimited color choices make StoTherm ci XPS one of the most versatile and innovative products on the market today. A cutaway drawing of the protective layers of StoTherm ci XPS insulation with an exterior Lotusan coating. Many of today’s building designers and owners find themselves contending with the need for an advanced insulated wall cladding that meets the country’s increasingly rigorous IBC building codes such as Title 24, IBC, IECC and ASHRAE 90.1. What they want is efficiency, durability and a flexible range of exterior appearances. Sto’s answer? StoTherm® ci XPS continuous insulation. StoTherm ci XPS is an integrated, continuous-insulation wall system that is air & moisture-controlled, thermally-efficient and highly durable. 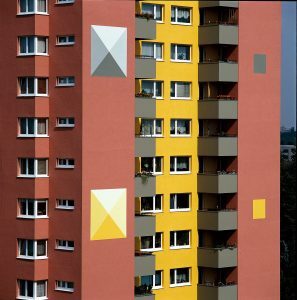 It helps cut energy costs, reduces maintenance expenses by extending the building life cycle and adds value by offering designers a variety of aesthetic options thanks to a wide range of decorative and protective finishes available in virtually unlimited colors. It checks all the boxes on today’s exterior specifications requirements list. 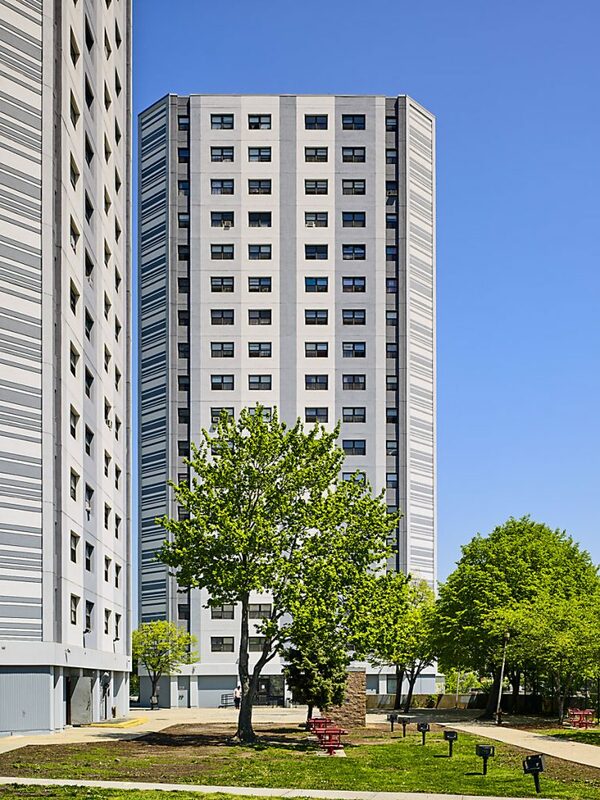 You’ll find more specification information on both ARCOM Masterspec Section 072419: Water-Drainage Exterior Insulation and Finish System (StoTherm ci Wall Systems – EIFS) and BSD Speclink-E Section 072400: Exterior Insulation and Finishing System (StoTherm ci systems). 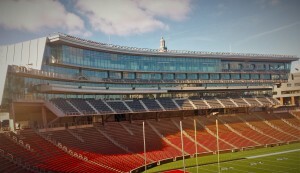 The newly-renovated Nippert Stadium at the University of Cincinnati incorporated StoTherm ci XPS in several of the wall structures. StoTherm ci XPS is a highly energy-efficient system thanks to the combination of a fluid-applied StoGuard air & moisture barrier and extruded polystyrene insulation with installation-friendly components that eliminate heat-dissipating thermal bridging from mechanical fasteners and minimizes heating and cooling costs. It requires only one trade to install the entire system, which both cuts the time to build and lowers overall construction costs. And its low allowable deflection value of L/240 compared to L/360 for stucco and L/620 for brick facilitates lightweight construction and produces a lower cost per square foot. This makes the StoTherm ci XPS system an ideal alternative to stucco and brick systems. Why? Faster, easier installation; high durability with a maintenance-friendly exterior finish that looks great and lasts. The economics are favorable, too; XPS material costs are typically lower than insulated stucco, brick or metal panel. StoTherm ci XPS is part of StoCorp’s range of continuous insulation systems including EIFS, Stucco, Cement board stucco and Sto Panel (prefabricated) wall systems. The latest news is that the company is now partnered with two of the insulation industry’s leading vendors, Owens Corning and Dow as suppliers for a key component of the StoTherm ci XPS system. This now means that Sto customers will have two options when choosing the durable, high-R-value rigid foam insulation that resists water absorption and significantly contributes to the Sto ci wall. This development makes it even more apparent that today’s StoTherm ci XPS is a true problem-solver. The news for architects and contractors is that the product now deserves a second look.